Yo! you got to get a Life. Last week was a busy week for me because there were so many events and happenings going on. I attended the Samsung GALAXY Life App Grand Launch on last friday 28th Feb 2014 evening at Renoma Café, Kuala Lumpur. The whole ambience and environment was setup in a very casual and party mode, unlike the usual formal launches with protocols and all that. Which was good, we get to mingle, chat and relax on friday night and enjoy. After all this GALAXY Life is all about enjoying and enriching our life. Glad to meet and catch up with some of the bloggers that night. GALAXY Life is about living a life that is more enriching. So with this new app I can redeem more deals, try out more new restaurants, spa, facial and looking forward for more new experiences. Plus the interesting interview and insight thoughts by the industry experts. As you know from my earlier post I have been using the GALAXY Life App for sometime already. You can read about my blog post regarding my experience claiming the Bizzy Body Weight Loss Offer for free using GALAXY Life. 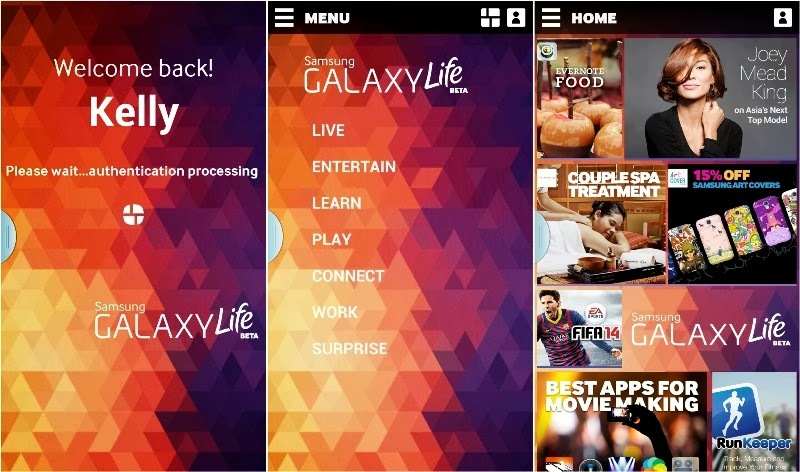 GALAXY Life offers Samsung users passport to amazing experiences and exclusive privileges. You can access to a community that is customized by categories, content and deals across seven categories – Live, Entertain, Learn, Play, Connect, Work and Surprise. There are exclusive deals on weekly basis from 50 partners to date with more than 120 offers and deals up to be redeemed. Some of the merchants / brands include Biotherm, Coffea Coffee, Easy Taxi, Food Panda, Mitsubishi Motors Malaysia, MPH, MyBurgerLab, Thule, Zalora, Bento Live, Bizzy Body, Celenrity Fitness, Christy Ng, Cuffz, Escape Room, Fa Ying by Rama V, Facial First, Ionnex, Ionnex Games, Ippudo Ramen, Italiannies, KLLive, Lazada, Lerun, Manzi Air, One FC: War of Nations, Pampas Reserve, Parkroyal KL, Rapid Fusion Fitness, Roomorama, Royce Chocolates, Sakae Sushi, Shawn Cutler, Shook!, Signature Restaurant, Sompoton Spa, Starhill Culinary Studio, Tesco, Transformers Expo 2014, UOB Kay Hian, VS Sport Complex and many more. However, the content will be provided by topic experts across Entertainment, Food, Fashion and Sports topics. For example the initial group of experts include Chef Bobby Chinn, sports commentator / journalist Jason de la Pena and fashion host / model Asha Gill.